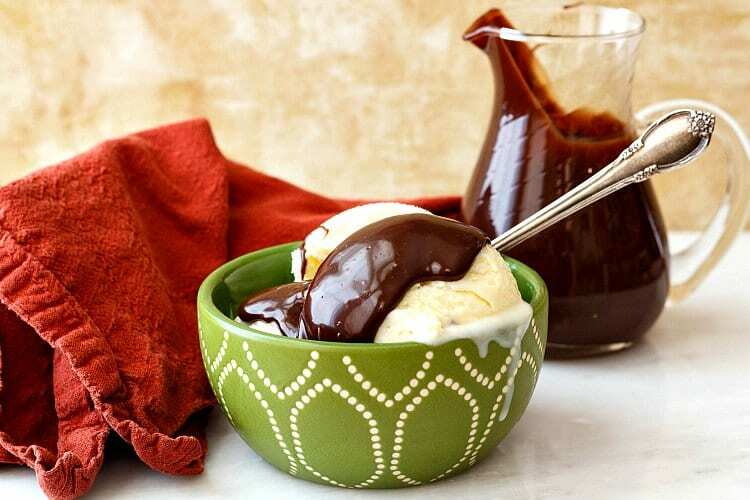 The Best Quick Hot Fudge Sauce: Maximum Flavor for Minimal Effort. Yes. You guys know I love some ice cream sauce, yes? I have a seriously dreamy blood orange caramel sauce on the site as well as a coffee butterscotch that will knock your socks off. I’ve even published a lovely mixed berry Chambord ice cream sauce recipe. But as much as I love caramel and butterscotch, sometimes over chocolate when it comes to cakes and puddings, I’m, when it comes to ice cream sauce, I’m all about the hot fudge. 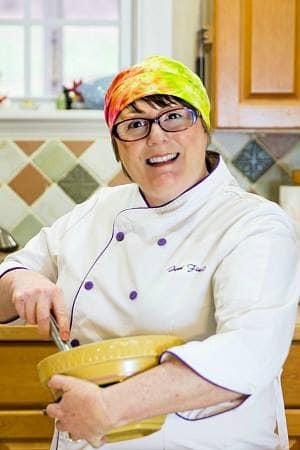 And today, I’m going to teach you how to make my best quick hot fudge sauce. 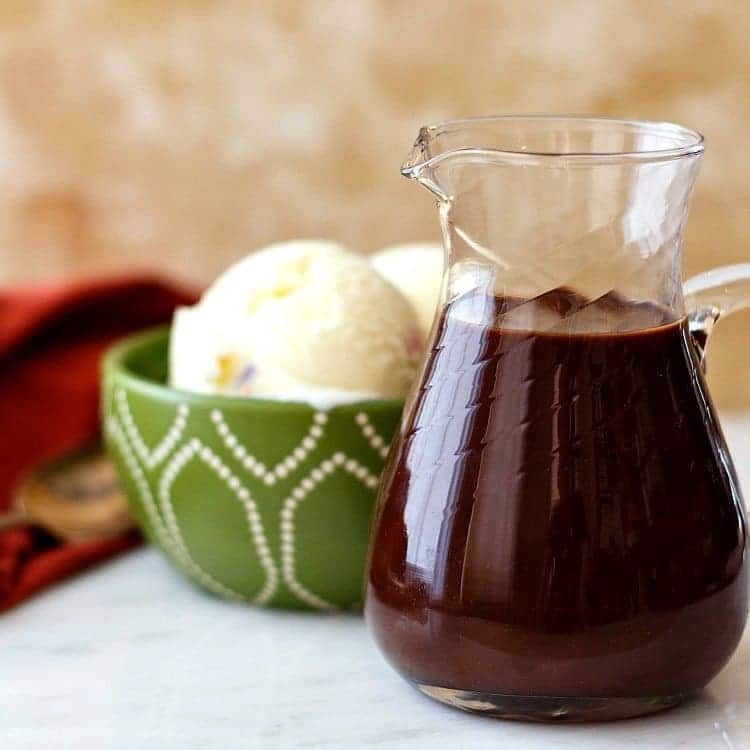 My Best Hot Fudge Sauce in the World takes a fairly long time to make–you have to boil a lot of ingredients together in order to caramelize them–but it truly is the best. I absolutely stand by that. But sometimes, what is necessary is a quick sauce. One that doesn’t get depth of flavor from a long cooking time but by adding just a couple Secret Ingredients to give the sauce complex flavor with a minimum of time and effort. 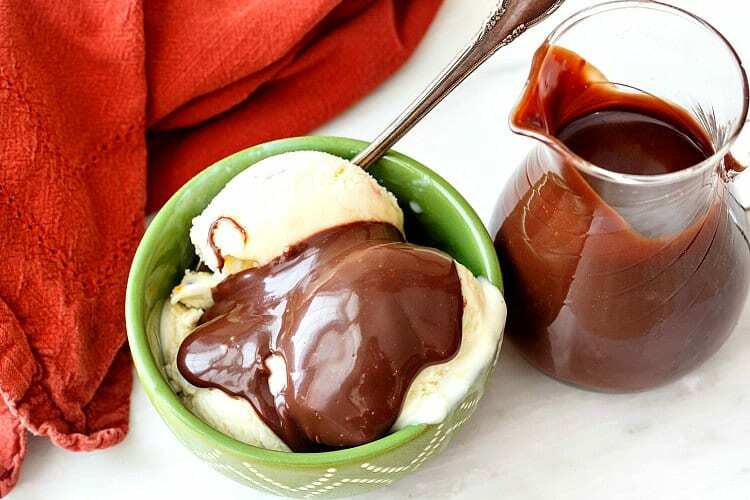 You can leave these “secrets” out of the recipe and still end up with a solid, delicious quick hot fudge sauce, but if you’re in the mood for complexity, come with me now. Like I said, there are a couple of Secret Ingredients I use to up the complexity of this sauce with a minimum of effort. Here they are. As always, thank you for supporting PCO by shopping through my affiliate links. For this quick hot fudge sauce, I added some malted milk powder and you could also just add malt powder–see Recipe notes (both contain flour, so don’t add either if you are gluten free), a dash of chocolate extract (yes, it’s a thing, and it dials up the chocolate flavor a bit), and 1/4 cup of coffee I mixed up with some instant coffee (feel free to use brewed coffee if you have extra. Don’t make a special pot just for this sauce). And, last but not least, I cannot emphasize enough the importance of owning–and using–an accurate kitchen scale. Once you start weighing your ingredients, you will never go back. I promise. Okay, let’s go. This recipe is just dump and stir–everything except the extracts go in a pot to get heated until the chocolate chips melt. Couldn’t be easier! This quick hot fudge sauce only takes about 5 minutes to make, but thanks to a couple of "secret" ingredients, it tastes like it took much longer. You're going to love it. In a medium saucepan, mix together the sweetened condensed milk, chocolate chips, corn syrup, salt, coffee, and malted milk powder. Heat over medium heat, stirring frequently, until chocolate chips are completely melted. Don't let it boil. Off the heat, stir in the extracts. Serve warm. Refrigerate leftovers for up to 2 weeks. *These ingredients are optional but add to the complexity of the sauce. If you wish, you can substitute water for the coffee and just leave out the malted milk powder and chocolate extract. 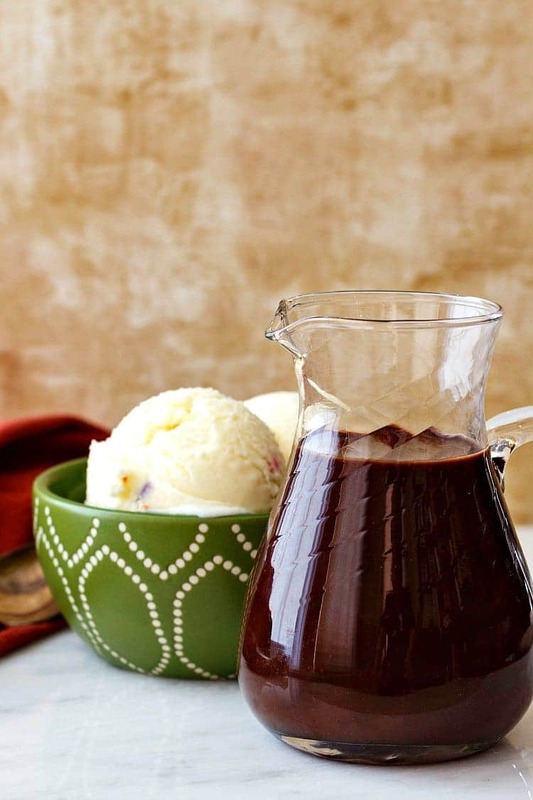 Using 1/4 cup of coffee or water will give you a thick fudge sauce that you might have to spoon onto your ice cream. If you'd like to pour it, use 1/2 cup. It'll still be nice and thick, but it will pour more easily. It's going to be great either way, so it's your call. If using malt powder, use a bit less than you would if using malted milk powder since it will have a more pronounced flavor. Start with half the amount. Unless you want an actual malted hot fudge sauce, keep the malt as a supporting flavor rather than allowing it to take center stage. And there you have it friends. 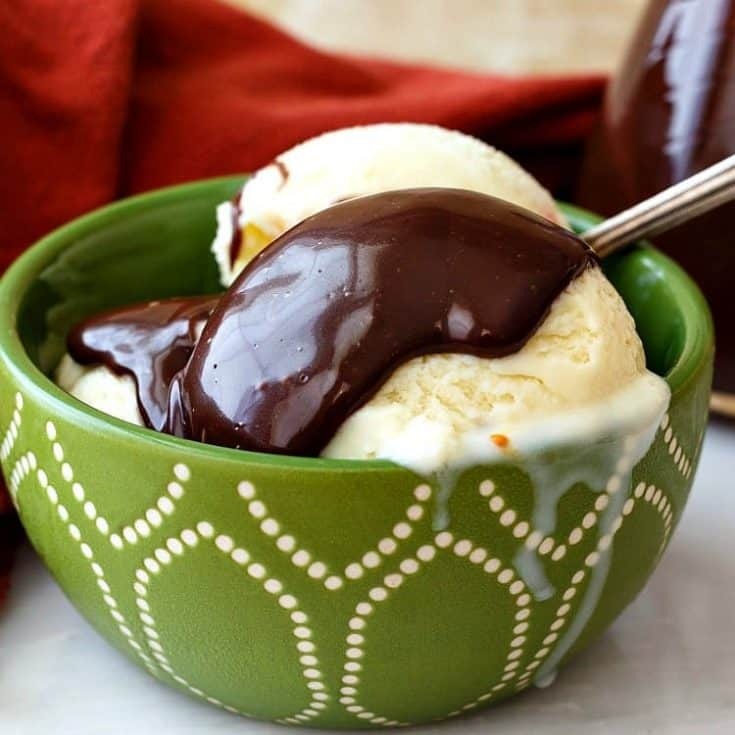 The best quick hot fudge sauce in all the land. I hope you enjoy it! Wow! This drizzled over plain vanilla or coffee ice cream and I wouldn’t leave the couch! Well have to build in an ice cream day when you’re here! Did you use malt powder or malted milk powder? You say in your recipe you used malted milk powder, but linked to malt powder. They are two different things.